Naked Lunch sits, arguably, at the peak of David Cronenberg’s creative peak. After four of his most successful and commercial films, The Dead Zone, Videodrome, The Fly and Dead Ringers, the latter three genuine masterpieces and among the best films of his career, arrived Naked Lunch, the notorious William S. Burroughs novel renowned as an unfilmable. Cronenberg’s desire to challenge himself and venture into a realm of narrrative unconventality inhindsight looks like a palpable creative shift for Cronenberg into an entirely new career phase. With the exception of a few strokes of conventiality, after Naked Lunch, we see a trend toward an impressionistic and the abstract, in particular Cosmopolis and Crash, and to a lesser degree Spider and eXistenZ. Naked Lunch’s deliriously non-sensicle and esoteric plotting lines up most closely with Cosmpolis equally deranged cinematic goals. Looking at all the protagonists in Cronenberg’s career, Peter Weller, one of lesser stars, resembles the ideal hero in Cronenberg’s world – tall, lanky, angular facial features, with a strong chin and jaw. There’s no doubt James Woods, Jeff Goldblum, Robert Pattinson, Viggo Mortensen, Ralph Fiennes are all cut from the mold of Cronenberg himself. Like the characters of all of the above actors Peter Weller’s Bill Lee starts off an an affable nave slowly drifting into a surreal world of grotesqueness. For Lee it’s his own inner mind, expanded through the mind altering bug spray powder of his trade which doubles as highly sought after narcotics. Lee’s a failed writer and former heroin addict eeking out a living as an exterminator. When Lee gets hooked on his own bug powder his hallucinations merge his world of bugs with his world of literature and writing. 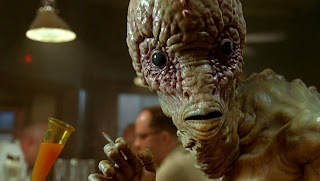 The literal connection of the two in the form of his typewriter/insect hybrids is realized by the inspired creature effects uniformly unique to Cronenberg. Lee’s typewriters, as insects, start speaking to him, convincing him he’s a secret agent who must travel to the African country of Interzone and kills his wife. Much like the trajectory of Cosmpolis micro-analyzing the plotting details of Lee’s journey is an exercise in futility. The joy of Naked Lunch and Cosmpolis like abstract and impressionistic artwork is the shape of the cinematic whole. The Criterion Collection disc features a truly remarkable high definition transfer, Peter Suschitzky’s cinematography sparkling and popping where all other standard definition versions failed. Cronenberg’s simple but distinct compositions are as strong as they have ever been, controibuting a ‘look’ in line with Cronenberg’s remarkably consistent visual style. Howard Shore’s music, frequently overlooked as one of the greatest composers of the last 30 years, is typically brooding, and combined with the punchiness of Ornette Colman's sax-jazz, complimentary to Cronenberg’s fusion-themed visuals.